● Casa.com offers free two-day shipping on orders over $35 within the continental United States. Please be aware that orders less than $35 will be subject to a flat shipping rate of $4.99. ● Consider joining the Refer-a-Friend program. If your referred friend uses your referral code during checkout, he/she gets 20% off the order ($20 maximum), and you get either $5 credit to your account or a $5 donation to charity made in your name. Note that the $5 credit is not available for customers in Arkansas, Colorado, Connecticut, Illinois, Minnesota, North Carolina, or Rhode Island. ● Consider joining the 5% program in order to get 5% back on your purchases. Learn more about the terms and conditions here. ● Visit the Deal Shop where you can save up to 50% off select items. ● Follow the company on Facebook and Twitter to learn about exclusive coupon codes and discounts. 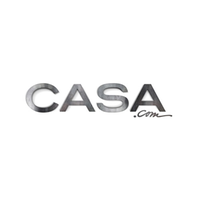 Casa.com frequently offers coupons through social media posts that will give you up to 20% off your order and the company will sometimes offer a rare coupon that gives you free shipping on your orders with no minimum purchase required. Furnishing your home doesn’t mean that you have to go into a local furniture store. Instead, you can order the pieces online from different websites such as Casa. This particular company focuses on modern pieces of furniture that you can put in your bedroom, bathroom, kitchen, and more. You can take a look at their cleaning items, storage solutions, décor, and the gifts that you might want to buy for a friend or a family member. The sale section gives you the opportunity to save on your total purchase as all of the inventory is marked down from their original prices. For most up to date offers check out Casa.com on Facebook and Twitter or contact Casa.com Support for any questions.